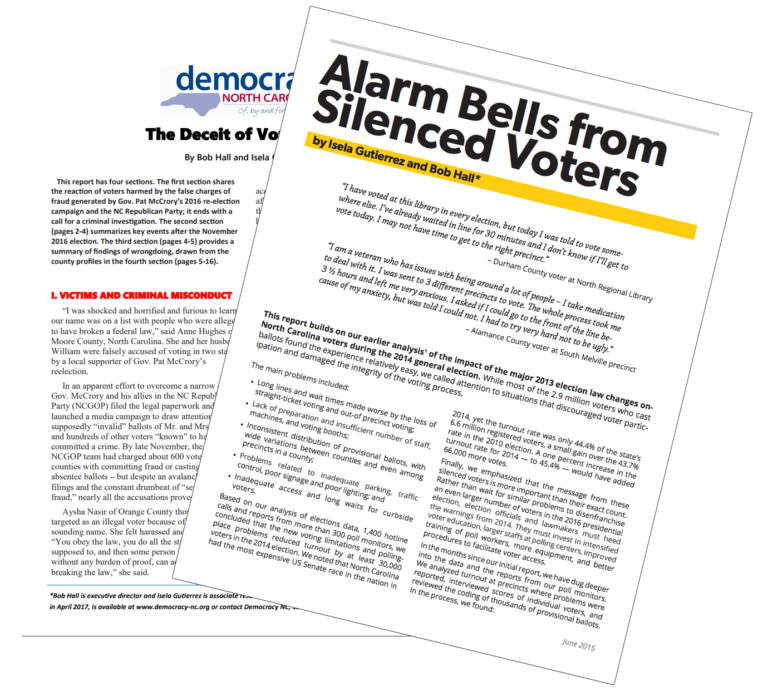 Democracy NC is a nationally-recognized source for reliable, nonpartisan research on money in politics, voter participation, and political reform. Below you’ll find all current and archived research reports, arranged chronologically with the most recent reports first. For more on the philosophy behind our research activities, please visit the “Research” section of What We Do. All are welcome to download and distribute these reports for non-commercial purposes. May 2017 – Did Sen. Ralph Hise Pocket $10,000 of Campaign Money? April 2013 – Who Are the 2013 Registered Voters Without a Photo ID? December 2012 – Analysis of 2012 Turnout: Who Voted in North Carolina? June 2012 – Do Republican Leaders Want An Election Meltdown in NC? April 2008 – Early Voting in NC: Are We Prepared? February 2005 – Factsheet: Does Healthcare Make You Sick? February 2004 – Who’s Funding Judicial Elections? May 1998 – Extortion, Bribery, or Business As Usual? Can Nuclear Dump Utilities Buy a Quick Fix? June 1995 – Campaign Spending and Special Interest Influence on Upward Spiral in N.C.